Cetrimide is a quaternary ammonium salt, which acts as a selective agent and inhibits most bacteria by acting as a cationic detergent (Cetyltrimethylammonium bromide). 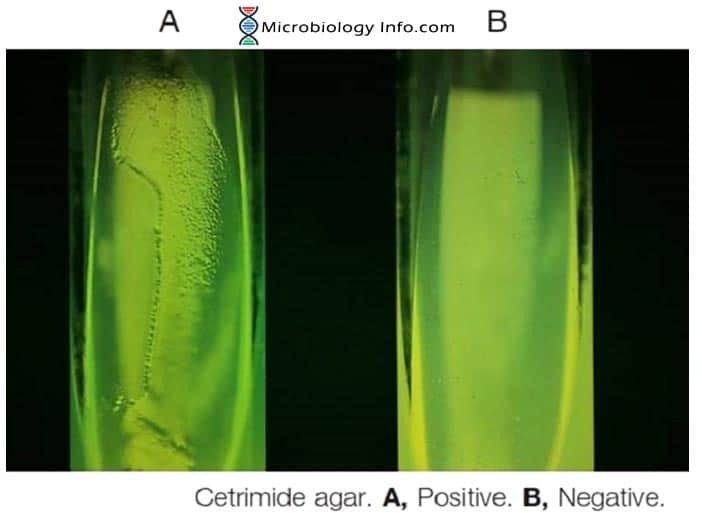 Cetrimide when added into a culture medium results into a selective solid medium recommended for use in qualitative procedures for selective isolation and presumptive identification of Pseudomonas aeruginosa and other nonfermentative, gram-negative bacilli. To isolate and purify Pseudomonas aeruginosa from contaminated specimens. The test is used to determine the ability of an organism to grow in the presence of cetrimide, a toxic substance that inhibits the growth of many bacteria by causing the release of nitrogen and phosphorous, which slows or kills the organism. Pseudomonas aeruginosa and very few other organisms are resistant to cetrimide. Pseudomonas aeruginosa produces a number of water soluble iron chelators, including the yellow-green or yellow-brown fluorescent pyoverdin. When pyoverdin combines with the water-soluble pyocyanin, the bright green colour characteristic of Pseudomonas aeruginosa is created. A culture medium containing 0.03% cetrimide is employed for the detection of organisms and especially Pseudomonas aeruginosa. Organisms resistant to cetrimide withstand its germicidal activity resulting in growth which is observed on the inoculated slant of the agar medium. Enzymatic digest of gelatin (20 g), MgCl2 (1.4 g), K2SO4 (10 g), cetrimide (cetyltrimethyl ammonium bromide) (0.3 g), agar (13.6), pH 7.2. Inoculate a cetrimide agar slant from an 18-24 hour old pure culture or directly from the specimen. Streak so as to obtain isolated colonies. Incubate at 35°-37°C for up to 7 days. Examine the slant for bacterial growth. Positive: Growth, variation in color of colonies. Visual examination may also reveal the typical yellow-green to blue color which indicates the production of pyocyanin. Used for the isolation and identification of Pseudomonas aeruginosafrom clinical and non-clinical specimens. It may also be used for determining the ability of an organism to produce fluorescein and pyocyanin. The test can also be used for microbial limit testing for non-sterile products. Some enteric organisms will grow and exhibit a weak yellow color in the media. This color change is distinguishable from the production of fluorescein. Growth on this medium alone is not sufficient for identification of Pseudomonas aeruginosato the species level, since other non-glucose-fermenting species may grow. Lack of growth on cetrimide agar doesnot rule out an identification of Pseudomonas aeruginosa.